To say democrats are not vindictive when they hold seats of power is an understatement. 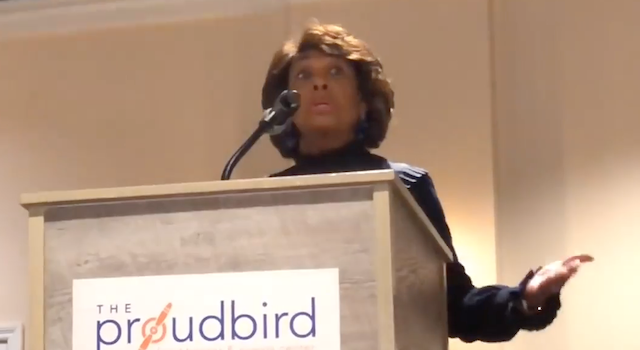 Aside from the promises they’ll go after Pres Trump over Russia Russia Russia, Judge Kavanaugh on false claims of sexual assault, here we have the vile and quite dangerous Maxine Waters telling attendees of the Black Women’s Network there will be payback against banks, insurance companies and Wall Street. These institutions have paid a price since the 2008 crash, and let’s be honest they were operating in an arena legislators created because they were making money off of what these institutions were doing. Lawmakers created laws that opened the door for what banks, wall street and insurance companies have done to get rich off of us. So everyone is guilty, but these institutions have already paid a price and are under stricter regs. For the record I WAS THERE, I WORKED in the lending industry at the height of the lending boom. I know what was going on and how everyone had their hands in the pot, including politicians like Waters who is part of that mess like all the players. Don’t believe her lies as she takes this stand against the industry, she like many in DC created that mess. What you have here is a corrupt legislator going on record how she will abuse her seat of power as Chair of the Finance Committee, IF the democrats win the House. This is also about the left’s hate for capitalism; it’s fine for them to get rich off of system they enabled but they must close the door so no one else can enjoy wealth. They also don’t like it when these institutions support leaders who don’t have a “D” next to their name, so regulate them out of business. She rants about the people whose lives have been wrecked, but let’s be clear it’s because they were ignorant, didn’t ask questions or read the fine print. That said Waters is vowing to wreck more lives, how will this help us Mad Maxine? How will trashing banks, lending institutions etc help America and those still down and out like yours truly? It won’t, but you don’t care so long as you have yours when everything comes crashing down. Go ahead America sit home election day, you’ll get monsters like Waters who will run the country right into the ground.